This week I have the pleasure to introduce a very talented artist to all you readers. There could be no better introduction to her than her cards. Just sit back and I would request all you to take some time and read this wonderful interview. Thanks Shalini for being a part of CZS. 1.Can you share with us a bit about your art/craft, yourself and how it got started? Hi, I am Shalini, a C.A. by profession and am card maker by passion. I actually had to spend a considerable amount of time thinking ‘how did it all begin’… but trust me I still don’t have an answerJ. Somehow, I have been drawn to paper and colors ever since I was a kid. I remember accompanying my Mum to her office, where I would quietly(yes, without disturbing her) spent the entire days sketching and coloring and general messing around my scrap sheet. At the end of the day Mom would put it up and pat my back. So, probably that’s how it began. I love trying my hands at different stuffs all the time, be it oil painting, glass painting, murals, knitting, crochet, etc etc… have also loved giving things a try… however, during my art/craft journey I slowly realized that I am more inclined to crafts than art!!! That’s where my real love lies… and then there has been no looking back… ever since I took up ‘card making’ as my hobby seriously, it’s never been better… have learned a whole new world of techniques, ideas, tools, materials that exist… and in the process have come in contact with some beautifully talented people from around the world with similar passion for paper craft. 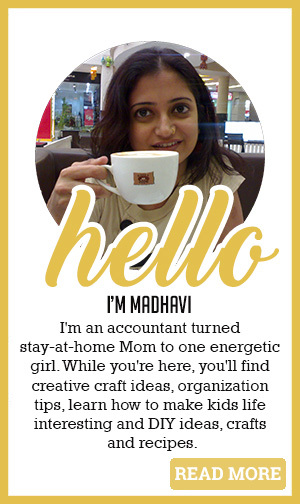 Today sharing my blogging and crafting experiences with you all as a guest blogger on Madhavi’s blog, I feel very touched and truly honored. 2. Is Craft your Passion or Profession? a. How many years have you been into Art and Crafts seriously as a profession? b. What’s the best part of having your own business? c. What surprised you about having your own business? d. How and where do you advertise your product? e. What are your future goals for your business? a. What do you do with the cards that you make? I usually make cards for friends and family. I love making cards for people I know would value them and love receiving them. Though on some occasions I have also made some bulk cards for a diwali and Christmas exhibition I put up with some friends. The rest of the cards which I keep making for my blog are neatly filed with me for sudden future needs. 3. Do you have any favorites in the cards that you have made? Well, that would be a tough question to answer but on second thoughts yes! I made this card for a baby girl and a pair of booties to go with it… they are very close to heart! 4. What type of cards do you like to make more of? 5. How did you come up with the brand name Craftcurry? 6. Do you take classes for others? nope, I don’t take classes on a regular basis. Though I have conducted summer workshops and singular demos for acquaintances on request. 7. Which of your tool is your favorite? My fave tool which I am lusting for is the ‘digital cutting’ machine. And out of the ones I own, my circle cutter is my favourite. A close 2nd are the MS punches, which of late I can’t live without! 8. What part of the creative process do you enjoy the most? I love planning and sketching out my card in my mini book that I maintain. 9. What keeps you motivated? Support and love from my family and friends keeps me going. Specially the comments of all my blog-friends is my lifeline. 10. What would be your tips, advice and suggestion to your fellow crafter’s? One small tip would be to look for inspiration and materials right around you. Most of the times, we fail to recognize the amazing treasure lying closest to us! 11. If you had no financial or time constraints, what dream project would you like to work on? Wow, that would be fun!!! I would love to make a never ending supply chain of cards to be sent to an orphanage really close to my heart! 12. Do you have any other website / blog that you run? I am a part of the team of ‘www.crazyaboutatcs.blogspot.com’. It’s a blog dedicated to ATCs(Artist Trading Cards), the first ever in India. I really like ur craft works. Its really amazing. Specially ur Card making. I’m also intrested in doing paintings. Hi madhavi, I am a regular follower of your blog. In your get crafty blog you had info /history about various crafts like thangka/ganjifa/worli etc. Here I don’t find any of those.are you planning to include in future? or have omitted.My humble suggestion is to include those I found very interesting. the site is still the same contents which were there previously are still here. The categories have been condesed in to a collapsing format.If you click art and crafts of india. you can see all the necessary details. Wonderful cards ,just looked &looked. Very ,very beautiful. Great encouragement for my crafty ideas. and where do u get these tools. pls send me a mailo.abt this..
if there is anything particular you would like to know, do lemme know… would be glad if i can be of any help!!! your work is very nice.i like all. Can u teach me mosaic art…? Im from delhi and im interested in mosaic!